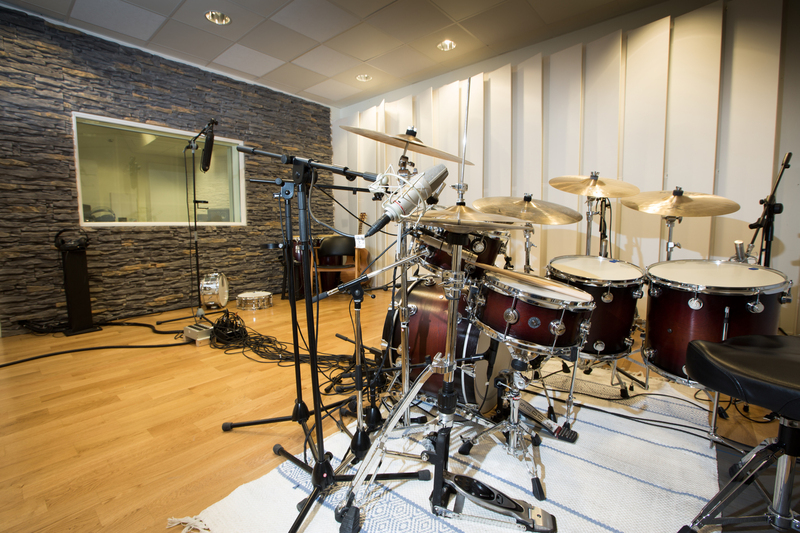 If you want to achieve great sound from your drum kit, the room you’re recording in is a huge factor in producing optimal sound. Finding a room with the right balance, character and acoustics to compliment your drums, especially in a recording, might be bit of a challenge. Many rooms in home studios are often too small, too live, too dead, too bright or too dark, and it can be a mess to compensate for bad room modes in a mix. Another issue with drums is that they are very loud by nature, and neighbors can present another challenge when choosing a room for a home studio. Putting that to the side for now, we’ll look at some interesting options you can consider when setting up a recording space. When I started to build my own drum studio, I realized that there was a huge range of options available to construct a great drum room. It took me a few years, plenty of experimentation and some great help from studio designer Philip Newell before I finally achieved a sound from my room that I really enjoy. In this article, I would like to share a few drum room concepts that all have their place within famous recordings and that have historically contributed to plenty of great drum sounds. Around the 1970s, drum kits were often placed in small, isolated drum booths. By severely muffling walls, floors and ceilings, the result was a room without much acoustic influence for the drum kit. Drummers would produce a very tight drum sound because no sound waves could bounce off reflective surfaces in these rooms, but many drummers claimed their instruments didn’t feel real and authentic in these dead spaces. As a result, it could be very tiring for a drummer to play in these dead, dry, small rooms without much life or support for their drum kit. These rooms also presented a challenge when communicating with other musicians while playing. When a specific character is wanted from a room, we often refer to this as a live room. Reflectivity is the apparent “liveness” character of a room, and a live room has more hard surfaces that produce reflections. If a room absorbs more sound and offer little reflective qualities, then it becomes more dead with less character. All live rooms are very individual in their sound and aren’t necessarily designed to be a recording room or a drum room. Character rooms can be really cool in some situations and less cool in other situations. This is why many recording studios still prefer to design their rooms to be fairly neutral, allowing them to be more flexible. When Phil Collins recorded his solo debut “In The Air Tonight” in Studio 2 at the Townshouse, it set off a whole generation of stone room recordings. Many recording studios today design their rooms to be fairly neutral. Recording engineers often want instruments or voices to sound as accurate as possible without having the room color the sound too much. In a neutral room, we’re trying to avoid some frequencies from dominating others. For example, in a room with too much bass build-up, the bass drum can start to mask the rest of the drum kit. The toms and snare might sound dull when bass frequencies decay over a longer time than the upper frequencies. Put differently, we might miss hearing details in other parts of the drum kit or other instruments in the recording. This will make the job harder for a mix engineer who needs to compensate the unbalanced recording. At the same time, it could also present challenges for musicians if the room isn’t well balanced; a drummer would need to compensate for this imbalance in his playing. For example, a drummer would have to ease up with his foot on the bass drum to compensate for all the bass build-up in the room, but this would also change the sound character, and not only the level of the bass drum. It should be noted that mid frequenciesy build-up can also occur, requiring a deft touch with the snare and the cymbal to achieve a more balanced sound in the recording. The more experienced drummers are aware of this and always compensate their playing to a degree, depending on the balance in a room. An excellent resource about about planning, building and improving your recording studio. Check out the Recording Studio Design by Philip Newell.